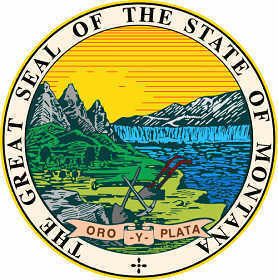 The Montana state seal identifies government buildings and officials and is a centerpiece for the Montana state flag. The symbolism, history and emblems of the seal are described in this article with fast facts and information. The overall image on the seal represents the landscape and the early industries that were important to the economy of the state. The sun rises of the land signifying a bright future. 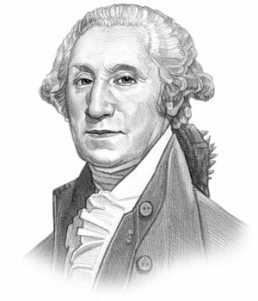 The Montana seal is kept and used as required by the Constitution and laws of the state. This is a flyer depicting the 1904 design of the Montana seal. The elements of the central image are the same as those shown on the current seal design but the positions and proportions have been changed. The pictures are interesting as they reflect the lifestyle of the early inhabitants of the state. The covered wagon pulled by mules are carrying settlers to a new life. They are heading towards Indian lands which are depicted by the tepees. The picture on the other side of the seal depicts miners. Gold, silver, copper lead, zinc manganese and coal mining all played an important part in the history of the state. The discovery of gold in the mountains of Montana in 1862 was closely followed by the discovery of silver in 1865. This led to the Montana gold rush and the region became known as the Treasure State.